Happy Thanksgiving! This holiday weekend has been full of much needed rest, family time, and good food! Our Thanksgiving meal tradition is turkey and canned cranberry sauce (as in the can-shaped cranberry sauce). Yum! 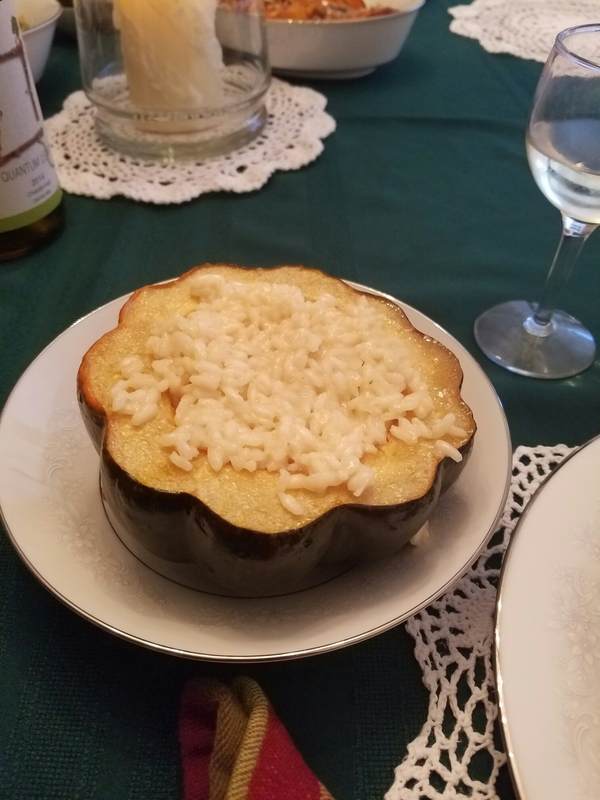 I’ve never made risotto, despite Merideth and I’s religious watching of Gordon Ramsay shows, and this seemed like a fun way to dress up Thanksgiving dinner! Risotto isn’t so much difficult as it is tedious a little, and this took about 30 minutes of active work to complete. However- it is probably one of my favorite dishes so far, and is so rich it could stand as a meal on its own. 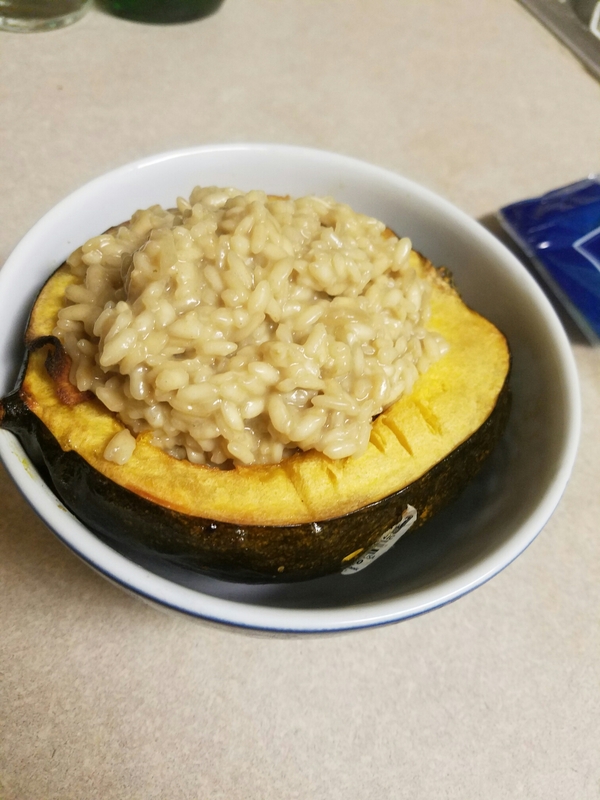 The squash bowl made the dish extra fun and savory! For this, I used powdered porcini mushrooms from The Spice House of Chicago, and could be substituted for chopped mushrooms in the saute stage. This ingredient is optional, but I really enjoyed the depth of flavor the mushrooms added. Melt butter in microwave and combine with brown sugar and bourbon. Brush butter mixture onto inside of squash and cook for 45-60 minutes, or until flesh can be pierced with fork. Melt butter in large saucepan. Once melted, add chopped onions and minced garlic, as well as mushrooms or mushroom powder (if using). Cook until fragrant and onions become translucent. Warm chicken broth in separate saucepan. Stir rice into butter mixture, coating rice thoroughly. Cook rice for 3-5 minutes, or until edges of rice become translucent. Add 1/2 cup of wine to saucepan and stir to deglaze pan. Simmer until wine is absorbed. Add chicken broth one ladle at a time to rice, simmering and waiting until liquid is absorbed before adding more broth. Adding the broth gradually is key! Taste rice after about half of the broth has been added for proper consistency. Risotto should be the consistency of thick porridge, and broth will be absorbed more slowly. Add one final ladle of broth and the parmesan cheese to the risotto and stire until melted. 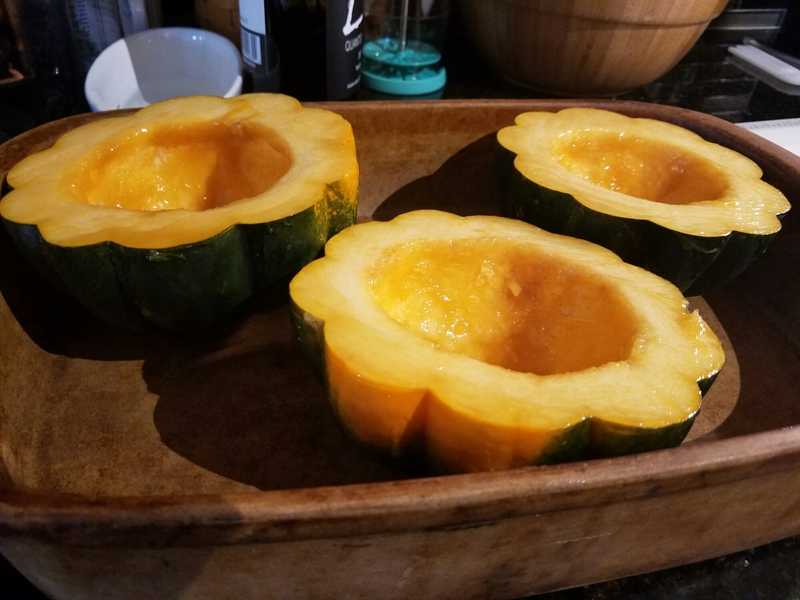 Serve immediately in roasted acorn squash bowls.